I'm super excited to host a giveaway once again! This time it's to win business cards to PrintRunner.com! PrintRunner.com was started with a dream and a small press. Their company became one of the best quality printers in Southern California. They are committed to present high quality full color printing with a price that anyone can afford. 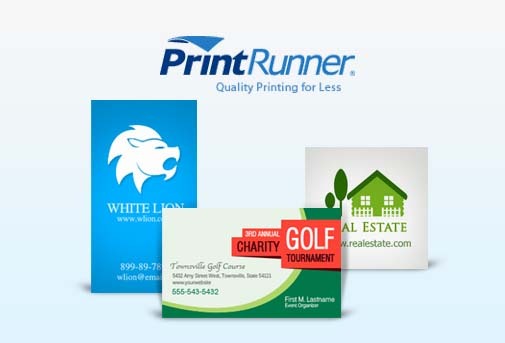 PrintRunner is a full service, high quality printing that continues to grow. It is so easy to print online with PrintRunner. They print business cards that look expensive, professional at an affordable rate. Note: This giveaway is open to US Residents only, ages 18 years old and above. Winners are allowed to win only once over a two-month period. I will need to verify with the company that you have not already won a previous giveaway. Disclaimer: The opinions on the post are my personal take on the product. This blog is a personal blog written and edited by me. I am not compensated to provide my opinion except for receiving the products themselves to test out. PrintRunner provided me with a free set of business cards. They will be given to me at the same time as the winner gets their prize. I love that they have Bumper Stickers too! This is amazing cards idea...really inspiring work..!!! !